This New Era bobble hat is made from 100% polyester (shell) and comes in the teams official colors. It comes in a one size fits all and is a yellow and blue colored hat with a blue and yellow crest logo and a yellow colored pom bobble on the top of the hat. The New Era official NBA On-Court Collection features lux fabrications, innovative design elements and our unique DualChrome team logos. Inspired by the on-court and off-court culture of the game, the Official On Court Collection represents the next evolution of NBA headwear. Put your team spirit on full display with this stylish 2-Tone Hardwood Classics snapback adjustable hat from adidas! 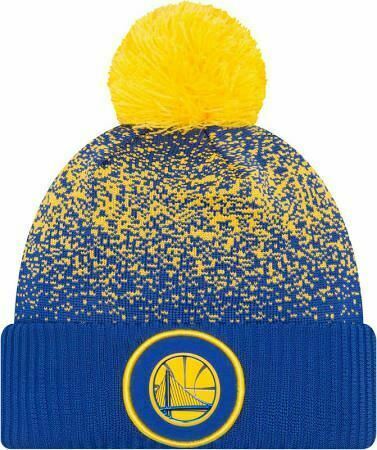 This hat is perfect for a true Golden State Warriors fan like you who doesn't mind flaunting your team pride. It features a unique design with cool Golden State Warriors graphics and a flat bill.